Kim came out to see Kanye’s floating stage for herself. Kanye West brought his Saint Pablo Tour to Toronto on Tuesday night for the first of two back to back shows at the Air Canada Centre. Fans started a veritable mosh pit under Kanye's floating stage during "All Day," and, in general, the performance seemed to be greeted with high energy. 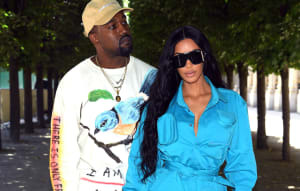 In addition to the unorthodox stage show, fans were also treated to a special surprise: Kim Kardashian was spotted on the ground below the stage watching the show with the rest of the crowd. See more pictures and videos of Kim Kardashian in the crowd at Kanye West's Saint Pablo Tour stop in Toronto below.